ORANGE PARK, Fla. - March 19, 2019 - PRLog -- The wait is over. Five designer decorated model homes are now open at the community of GreyHawk. Nestled within the expansive evergreen forests of northwest Clay County, this new recreation-rich residential neighborhood offers the latest in home designs by the area's top builders. With its spectacular natural setting, many home sites at GreyHawk feature preserve and lake views. 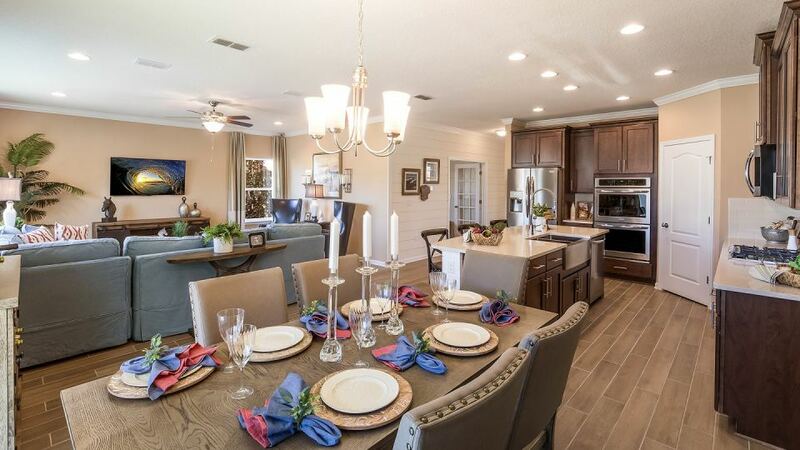 "Our community homebuilder team is offering a variety of distinctive home designs ranging in size and style to meet the needs of today's active families," said Mike Taylor, North Florida Regional President of GreenPointe Communities, the developer of GreyHawk. "With its convenient location, community oriented lifestyle and resort-style amenities, GreyHawk is quickly becoming the finest place to call home." GreyHawk's premier builders, which include D.R. Horton, Lennar and Richmond American Homes, are offering single-family, one- and two-story homes ranging in size from approximately 1,600 square feet to more than 3,100 square feet and priced from the $200s to the $400s. And now, GreyHawk has five newly opened models ready to tour and move-in ready showcase homes under construction. D.R. Horton's Magnolia model is designed to soothe and excite with sky blue and sesame sand accents wrapped in Magnolia whites. There is special detailing throughout the four-bedroom home including stylized shiplap, bead board and architectural molding details. The welcoming two-story foyer flows into a magnificent great room and opens to an expansive kitchen with walk-in pantry. The dining room features a wine bar niche overlooking the fireside lanai and garden view. The flex room is designed as a den that has something for everyone in the family with media, study area and extra guest space. Lennar's Tivoli model highlights bright greens, blues and pinks inspired by springtime blooms. The home is light and bright with contrasting dark espresso cabinets in the kitchen and shiplap accents in the formal dining room and owner's suite. An adorable paisley wallpaper above the shiplap in the formal dining room adds a special finishing touch. Lennar's Patriot model presents a modern flair in shades of soft blue and white with pops of coral throughout the home. Designed with family in mind, the home features Lennar's Next Generation Suite with its own bedroom, bath, kitchen and garage. This home within a home plan is well suited for a mature parent or a college-aged student. Richmond American Homes' Jasper model is an inviting ranch-style home designed for family living and entertaining. The spacious great room flows into a large kitchen with a broad island, perfect for chatting with guests while whipping up culinary wonders. A nearby breakfast nook leads to a light-filled, covered patio that's ideal for morning coffee. An expansive master bedroom provides a soothing retreat space. The community's homes are located in a naturally beautiful setting around an amenity-rich community center. GreyHawk's walkways make it easy for residents to connect with their neighbors, burn off energy with a morning jog, bike ride or simply take an evening stroll. The Overlook, GreyHawk's lakeside amenity center, is currently under construction and planned for opening in Summer 2019. The Overlook offers something for every family member to enjoy including a lagoon-entry pool and a poolside fire pit. The fitness studio will feature state-of-the-art training equipment, cardio machines and free weights. The Roost, an open-air pavilion and bar, will be the place for lakeside gatherings and celebrations. The amenity area also includes a children's playground, tennis and basketball court, and an open playfield for a game of catch or pick-up soccer. GreyHawk families and their canine companions will enjoy the Central Bark, a fully enclosed, dog-friendly facility for exercise and meet-and-greet time in the great outdoors.